Supply chain globalization is a continuous challenge and many regulated companies must manage an increasingly challenging and demanding internal and/or supplier audit program without adequate resources. Outsource our highly experienced auditors today! (e.g. ISO 9001, ISO 13485, ISO 14971, 21 CFR Part 210, 21 CFR Part 211, 21 CFR Part 11, EU Directive 2003/94/EC, Health Canada Food and Drug Regulations, 21 CFR Part 820, 21 CFR Part 4, EU MDD 93/42/EEC [amended 2007/47/EC], EU Annex 11, SOR/98/282, Japan’s PMD Act, ICH Q6A, ICH Q9, ICH Q10, 21 CFR Part 50, 21 CFR Part 54, 21 CFR Part 56, ICH E6, ICH E2A, ICH E8, PIC/S PE009-11, and GAMP). 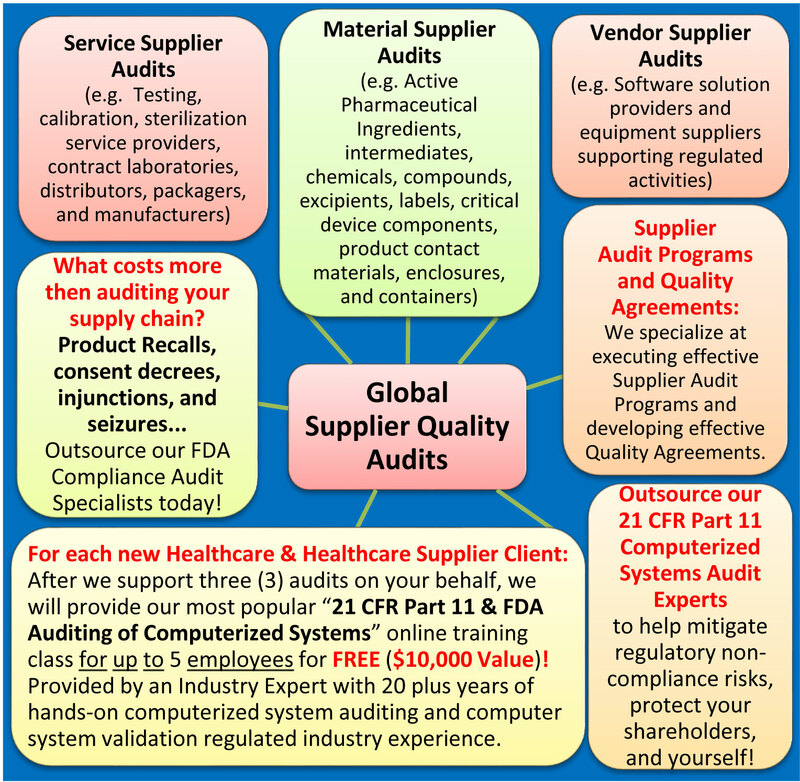 We provide high-caliber, FDA Compliance Specialists with 15+ years of regulated industry auditing experience; we provide a cost-effective, budget friendly, fixed price audit for each audit we support; our fixed price audit includes: pre-audit preparation; audit planning; travel time (U.S. only); the audit itself; daily audit debriefs; the final audit report with one review cycle; and to complement our professional auditing services, we assign a dedicated U.S. based audit administrator for every audit we support.